To kick off International Assistance Dog Week (August 5-11), Hawaii Fi-Do Service Dogs will be having a free informational workshop on Saturday, August 4 at 11 a.m. at the center stage at Windward Mall. The workshop's topics will include the differences between service dogs versus therapy dogs, what the new fake service dog Hawaii law is and the impact it can have on businesses, and what it means for those who abuse ADA access laws for service dogs. There will also be a demonstration on what service dogs can do and a Q&A from the audience. Numerous working teams and puppy raisers will be at the mall, handing out information on service dogs and the laws. “With the passage of the new fake service dog law, this is a good opportunity to educate the public and businesses about the law and learn how real and certified service dogs can perform tasks for their owners with disabilities,” said Jim Kennedy, Hawaii Fi-Do executive director. International Assistance Dog Week was created to recognize all the devoted, hardworking assistance dogs helping individuals mitigate their disability-related limitations. In addition to honoring assistance dogs during their special week, one of the goals is to raise awareness about these very special and highly-trained canines. Assistance Dogs transform the lives of their human partners with debilitating physical and mental disabilities by serving as their devoted companion, helper, aide, best friend and close member of their family. International Assistance Dog Week was established due to the efforts of Marcie Davis, a paraplegic for over 35 years and CEO of Davis Innovations, a consulting firm based in Santa Fe, NM. Davis is the author of Working Like Dogs: The Service Dog Guidebook, a resource book that captures personal stories, checklists and practical tips to provide the reader with an A-Z guide about service dogs and she is the host of the Internet radio program, Working Like Dogs, at www.petliferadio.com. As a member of a service dog team, she founded Working Like Dogs to honor assistance dogs around the world. 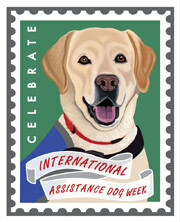 More information about International Assistance Dog week can be found at www.assistancedogweek.org.